It’s time for our annual trip to Michigan. I’ve blogged about it before. Here’s this year’s entry. Yesterday (Thursday), I packed after getting the lawn mowed. The lawn mower had been getting serviced for the past two weeks so the lawn was like a jungle. It could not wait until after the trip, so I mowed. Then, I met Adam for some wings and beers at QSL. Finally, back home, I was able to pack. It was a little bit of a restless night for me. It always is when I have a big trip planned. Nevertheless, 9:15 came… then 9:30 came. And then Adam and Tony came. 🙂 Two of my best friends are joining me for the trip this year. They showed up a little early (which is great). So after one final trip to the restroom, we loaded up and hit the road. We took a survey of fuel before we left and decided that stopping in Beaver Dam for gas would work for us. That was about 50 miles from home. After gas, Adam said he wanted some food. There was a McDonalds right across the street from the gas station so we hit there for some grub. We mapped out our next leg. 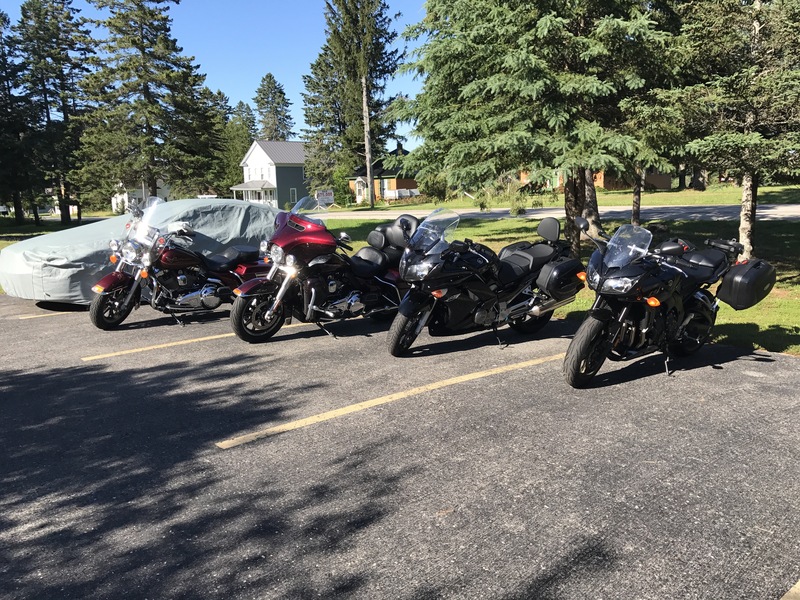 We all agreed that even though the bikes are capable of more than 100 miles, that is about all we’re good for. After that many miles, we get itchy and need to get off the bikes and walk around. 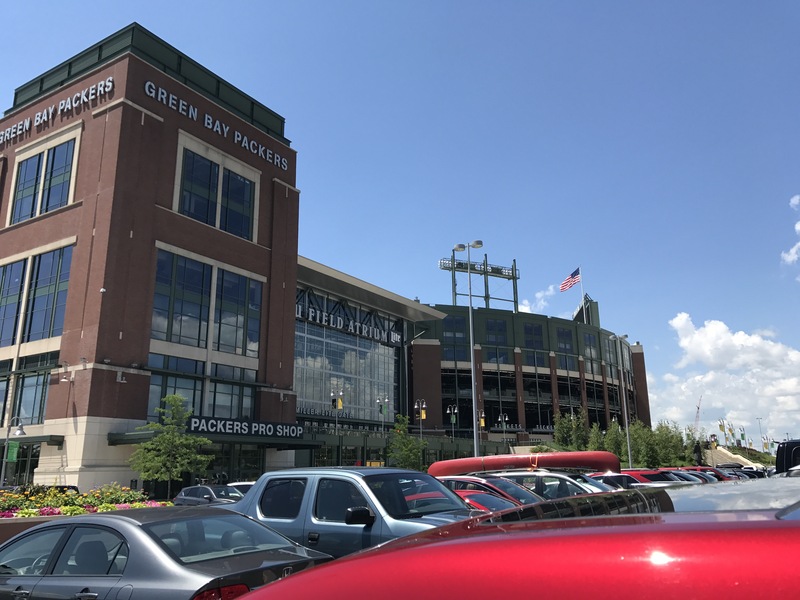 We checked out the route and Green Bay was the next logical stop. 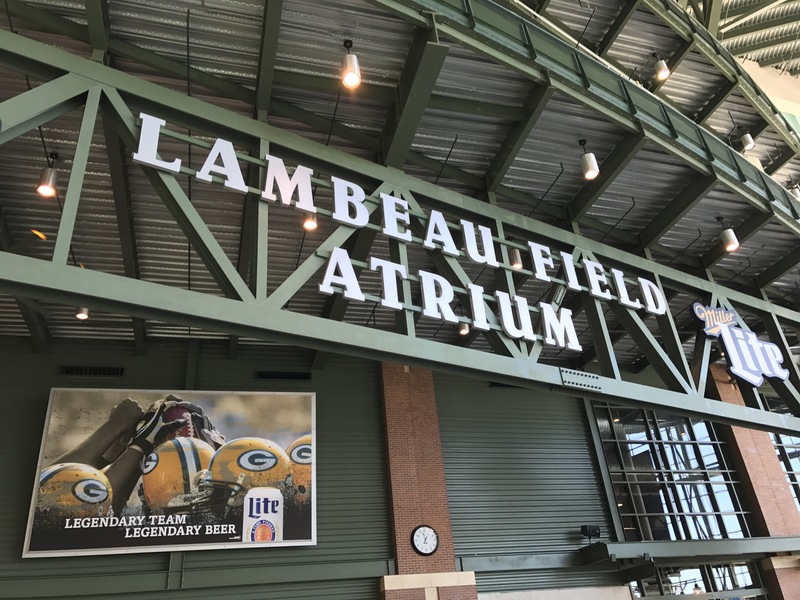 Tony said he’d never been to Lambeau field before, so that had to be the destination. 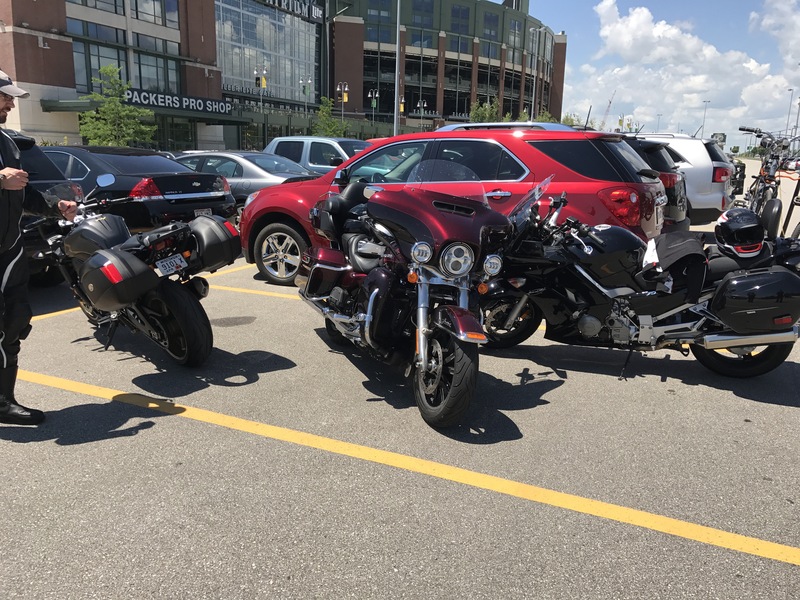 We rolled into Lambeau and were able to fit all three bikes into a single parking spot. We entered through the gift shop… er… Pro Shop but decided we needed a soda and some food. Up to the 1919 Kitchen we went. We all ordered some food and drinks. Then back down to the gift shop we went. I got a can cookie, a hat, a cool sign and a copper mug. Once we finished that, we decided that Escanaba would be the next good stopping point. 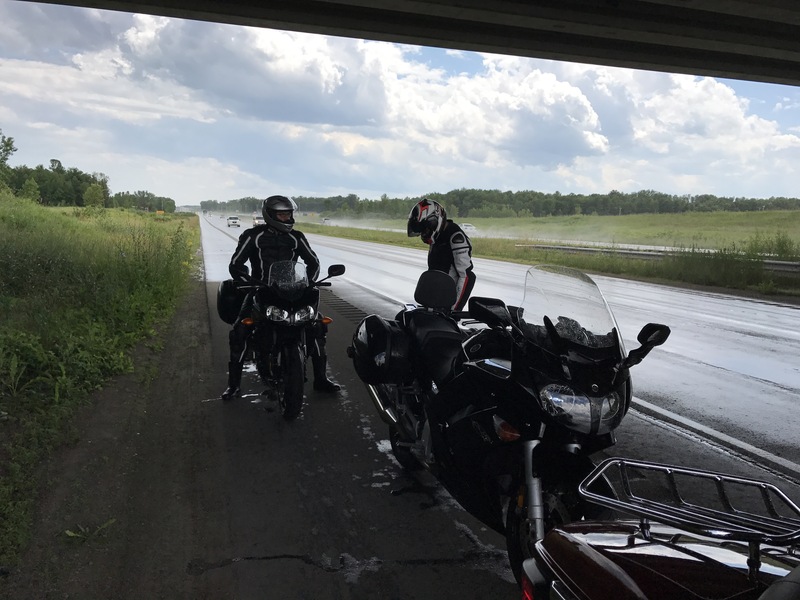 As we rolled out of Green Bay, we encountered a pretty good downpour. I was only wearing a T-Shirt so we pulled under a bridge so I could put on my jacket. Thank goodness I didn’t bring my new leather! We rode through the rain for a little bit, but it was a fast moving little storm. We cruised through Marinette and Menominee and hit another storm. We had a quick confab and decided to just go for it; that the storm would be another quick hitter. Despite the blue skies in the background…. … we were caught in a downpour! Sure enough it was. We encountered some dudes in some super sweet cars. They were flying! The five of us ended up making some really good time. 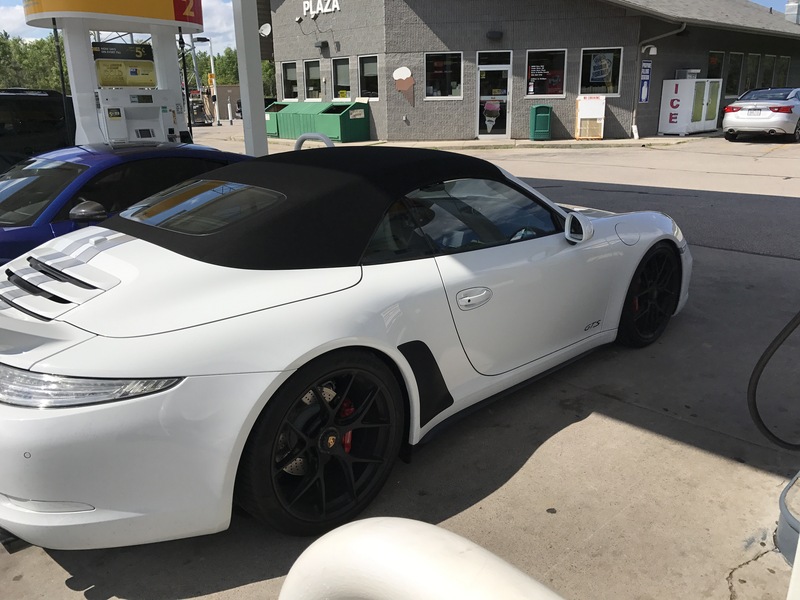 We pulled into a gas station about 30 miles outside of Escanaba and chatted with the guys. They were pretty cool and offered to run interference for us (they had radar detectors). They ended up getting on the road way before we did so we weren’t able to take advantage of their offer. We arrived in Escanaba and went to the Stonehouse for dinner. When we arrived, we were approached by an older gentleman (also from Wisconsin) who chatted us up about our trip and the bikes. He was also making his way around but he was on the last leg of his trip. It was nice to chat with someone, but it was a little weird. I guess it’s just part of being on a motorcycle trip. Dinner was great. 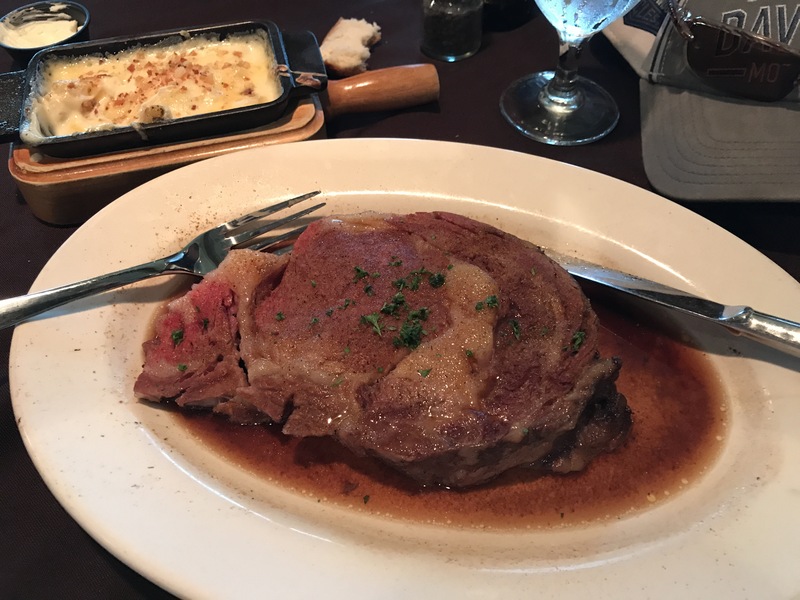 I had the prime-rib. That was many hours ago. I’m still stuffed. Getting it in the lines is REALLY HARD! From there, we cruised out and ended up at the Celibeth House. Roger and Darlene are as great as ever. They’re both crazy friendly. Unlike last time, the place is kind of packed. There are a lot of people here tonight. Adam was all about going to the bar, but he didn’t want to ride. I don’t blame him. I would go to the bar too, but I don’t want to ride either. Sadly, there’s no Uber here in the UP. I picked up a bunch of beers and we just hung out here at the B&B. It’s been a pretty great day. Tomorrow, we head out and arrive at Paul’s place. I’m looking forward to that.